While there are so many types of rugs that are available in the market today, traditional rugs stand out from the rest. Adorned with intricate details and elaborate motifs, these types of rugs are guaranteed to bring sophistication and class in your home. Not only are they highly special because of their distinctive vivid colors and exquisite patterns, but also because of the impeccable craftsmanship that goes into it. Traditional rugs are also known to stand the test of time as they enrich interiors timelessly and give them a lasting piece of history. They will never go out of date and can blend harmoniously in interiors, no matter what the current design style may be. 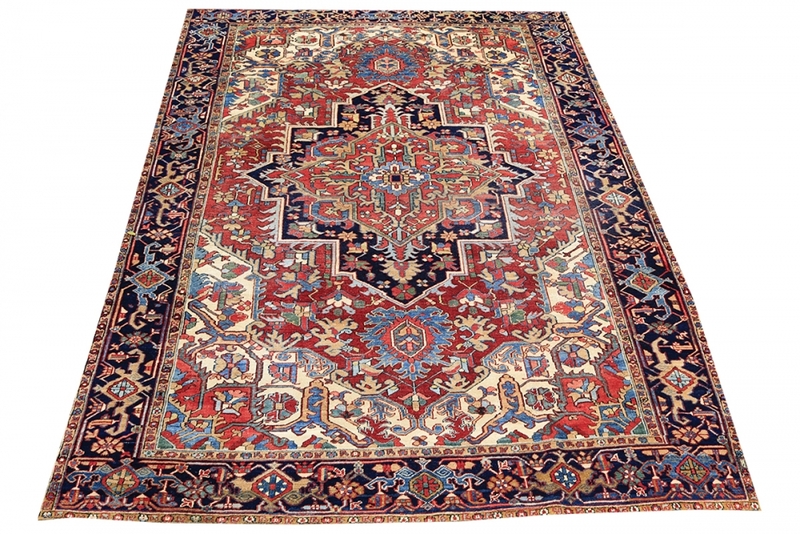 Among the types of traditional rugs, Persian rugs and oriental rugs are the most popular ones. Persian rugs are characterized by fine embroidery and oriental design motifs. It is considered to be more expensive than other traditional rugs because of the intensive amount of labor that goes into it. Patterns in a Persian rug are hand woven and knitted to perfection using techniques which date back to an origin of thousands of years. Its rich colors are perfect for bringing in a cozy vibe to a home. These types of rug is a perfect complement for hardwood floorings and can be placed in any area of the house, such as the living room, the dining room or even the bedroom. Shown above is an example of traditional Persian rug with a rich combination of colors and an intricate pattern of extravagant motifs. This traditional rug design features a medallion motif at the center - a symmetrical pattern which repeats all throughout the design. Another type of traditional rug is the Oriental rug. In terms of design, an Oriental rug looks closely similar to a Persian rug. Characterized by distinct looks which depend greatly on its country of origin, these rugs project an old world feel, making them ideal accent pieces for traditional inspired homes. 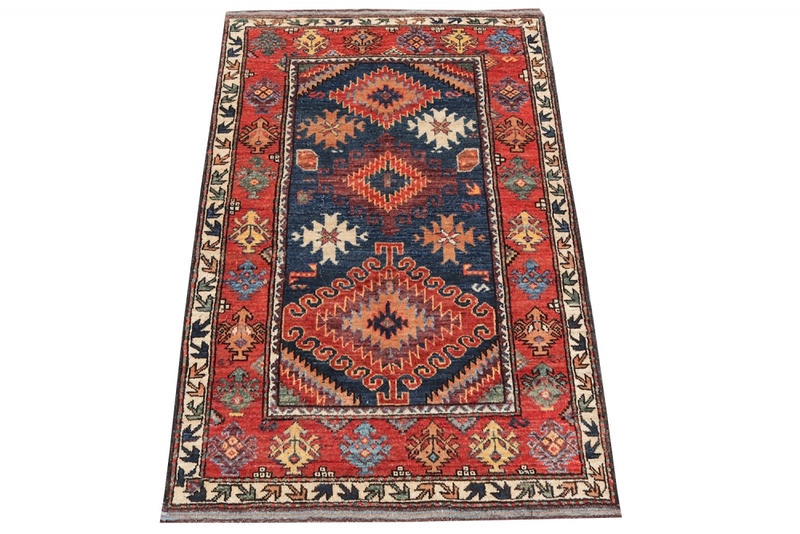 These traditional rugs are typically made from various materials like silk, cotton and wool. Oriental rugs originate from Central Asia, the Middle East, Morocco, India and Africa. This Pakistani hand knotted rug is an example of an oriental rug that is naturally dyed and woven using wool. Its subtle color and texture makes it versatile in terms of design application, making it a timeless addition to any space. This rug also has a manageable size which allows it to be placed in any area of the house, whether it may be in the bedroom, living room or office. In terms of interior design, one question still bothers most of us when it comes to the use of rugs as decors for our home. How do you choose and incorporate traditional rugs into your home’s interior? A piece of rug can serve as a strong foundation for developing the overall design of a space. Incorporating it into an existing interior may seem like a daunting task, but in reality, it is easy because of the endless options that are offered in the market. With the limitless designs ranging from a broad spectrum of patterns and myriads of colors, selecting the perfect area rug for your home can also be quite confusing. But we encourage you not to worry, because we are here to help you decide which traditional rug is the best for your home. Below we explore some key guidelines on how you can blend exceptional traditional rugs into your living space, along with some tips on choosing the right traditional rug for your home. Mix up traditional rugs with contemporary design. Contrary to popular belief, traditional rugs do not only suit classic and traditional inspired interiors, but instead, it can be used in a variety of room settings, regardless of the prevailing style of your home. Whether it comes in an intricate detailed Persian rug masterpiece or a simple geometric patterned Kilim rug, a traditional rug will surely find its way into working in a contemporary set up by either bringing a strong focal point of design or by blending harmoniously with all the other textures in the interior. 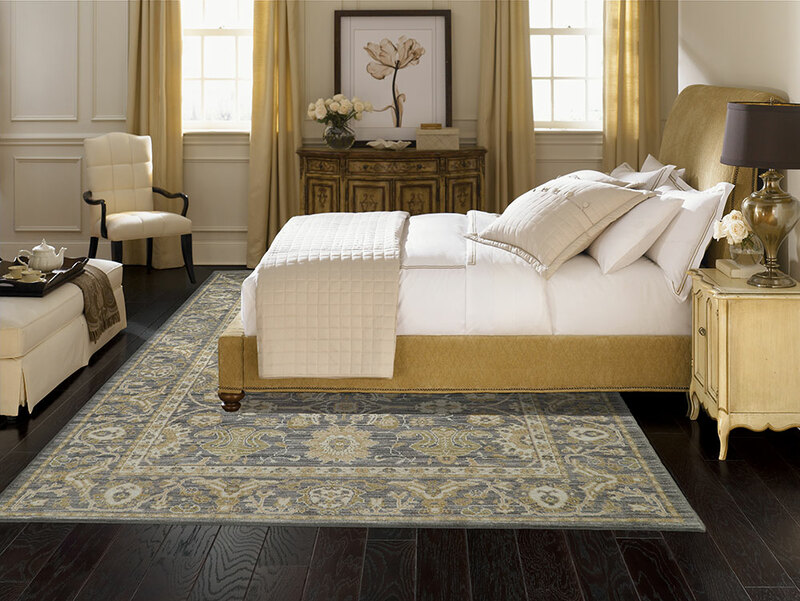 Antique and vintage rugs go well with modern homes because they stand out easily when placed in a minimalist interior. Also, the key tip to incorporating a traditional rug into a modern interior is to use it to establish the space and then add some matching traditional accessories like a vintage wooden chest or a brass candelabra. Place it against modern furniture pieces that are streamlined and unornamented to evoke that modern vibe. Fusing styles gives traditional rugs a more updated look. Another approach is to opt for traditional rugs that have geometric shapes and patterns. The modern style usually conforms to these types of designs as it puts emphasis on forms and shapes. For contemporary styles, you may try more organic shapes, like wavy patterns, semicircular forms or curved lines. No matter what the prevailing style of your home may be, a traditional rug can gracefully adapt itself into the interiors. This traditional rug got its design inspiration from the Moroccan style, but its look is more updated and fitting to the current home design trends. Leaning on the more contemporary side, this is appropriate for home interiors which are modern and minimalist. This traditional rug lends a quiet strength when placed in a neutral setting and its subdued colors will not overwhelm a space. Work your traditional rug with the rest of your color scheme. In order to create a harmonious design composition for your interior, make sure that the color of your traditional rug is tied to your room’s overall color palette. The uniformity of colors can be achieved by choosing an undertone in your rug pattern and sticking with it through other elements in your interior. For example, if you want to go with a traditional rug that has brown shades and splashes of green, include accessories such as pillows, vases or artworks that match these colors. However, if you do not want to veer away from the neutrality of a modern interior, choose a rug that has a light and subtle color in order to seamlessly blend it with the space. Whether aiming to create a monochromatic scheme, a complementary combination or an analogous palette, this design approach produces a subtle combination of decor that ties the space together. 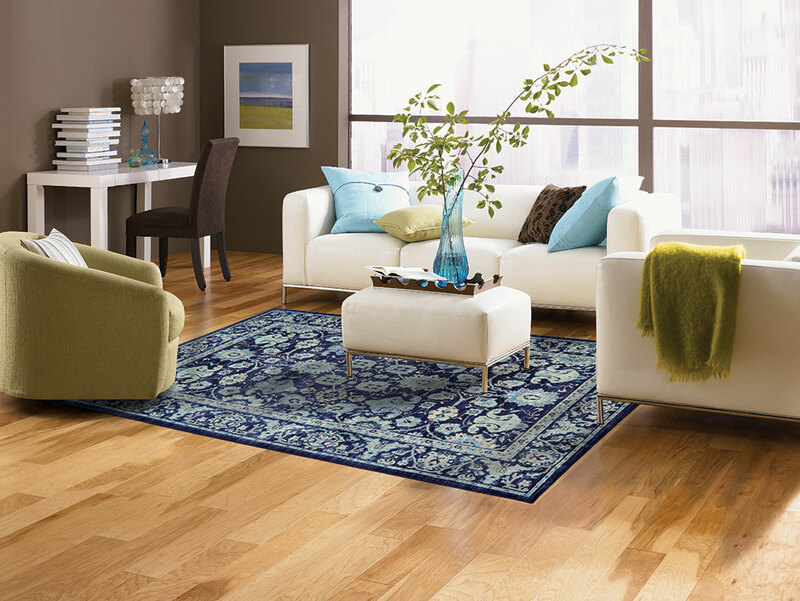 Shown above is the Pacifica Voltaire rug which displays traditional Persian design in a refreshing deep blue color. The cool color of the rug brings a calming effect to the space, instantly transforming it into a serene oasis of rest and relaxation. This traditional rug blends harmoniously with the light colored wooden flooring and the crisp white contemporary sofas. Colors are repeated by using matching accessories such as light blue accent pillows, a blue and green artwork and a tall blue glass vase are added to create a cohesive analogous color palette for this living room. Use your traditional rug as an accent piece. Contrast is one of the key elements in interior design. A striking traditional rug renders a bold statement that can serve as the main attraction for your home. If you want to create focus, use a highly elaborate motif which pops out in your interior scheme. Persian rugs are perfect for this because of its intricate patterns that can stand out it any space. For modern minimalist interiors, the introduction of pattern through the use of a traditional rug also brings an added visual interest that makes your living space more appealing. 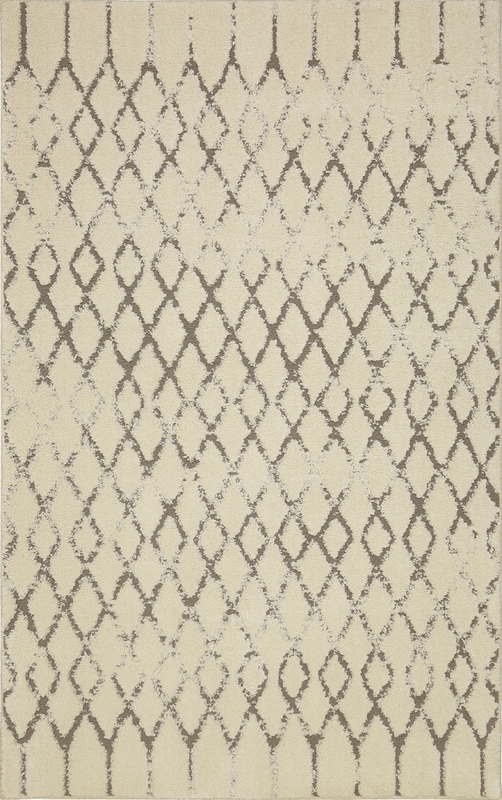 This Soumak rug boasts of artful geometrical patterns which are hand woven to perfection. With its rich colors and detailed motifs that display a fusion of classic Sultan Abad, Mahal and Nomadic design inspirations, this traditional rug will surely bring life to any space. The picture above also shows how this exquisite piece brings a pop of color to a neutral contemporary living space. Mixed with the natural coziness of rich stained wooden furniture, this traditional Soumak rug makes this place more warm and welcoming. Layer patterns to create depth and dimension in your design. Traditional rug offers colors and textures that are highly appropriate for adding contrast, depth and dimension to a space. Layering patterns can be achieved through the creative use of area rugs, window treatments and upholstery. Combining patterns may be a bit tricky to pull off, because if not done properly, your house can end into a visual chaos. However, with proper application, it is guaranteed to give you a unique room that exudes character and appeal. But how do you layer patterns? If you want to be more experimental in your design, you can combine two small pieces of traditional rugs to make your home interior extra thrilling. Two contrasting colors which are juxtaposed to each other gives your room an eccentric twist. However if you want to combine patterns but do not want to commit to the intensity of stark contrasts, then choose a pattern from your soft furnishings that you want to dominate the room. If your room has a heavily patterned wallpaper, try going with a traditional rug that has subtle patterns and soft colors, while if your traditional rug is too “busy” looking, the try to maintain the balance of the room by keeping other elements more subdued. Shown above is another variation of the Pacifica Voltaire, but this time, the colors are more subdued and downplayed to soft muted grays, beige and gold tones. It displays a “sun washed look” that is perfect for layering patterns since it is not too strong and won’t overpower a space even when mixed with other patterns. 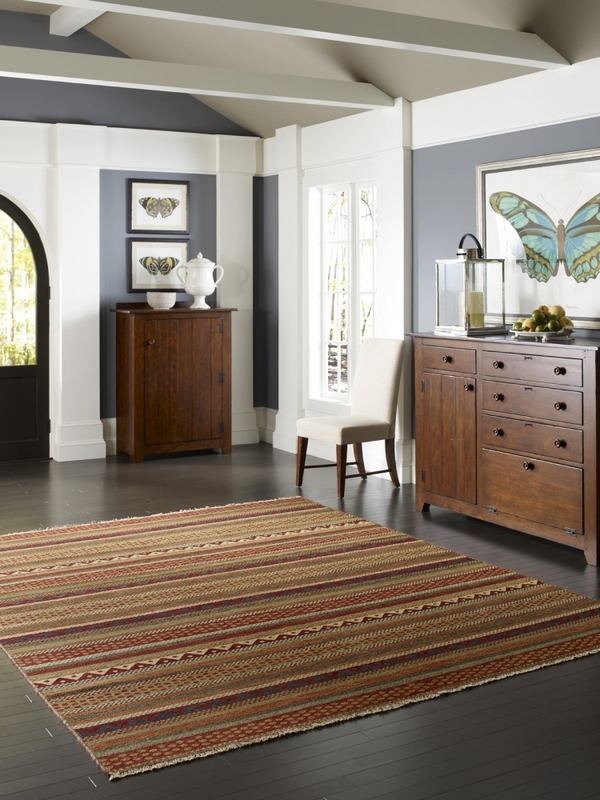 Use traditional rugs to liven up a negative space. Be creative in terms of application by bringing neglected spaces to life. Negative spaces such as hallways, a foyer, the front of the fireplace or a dresser, or the side of your bed are just as important as any part of your home. So there is no reason to give them less attention when it comes to design. The easiest way to transform these negative spaces into an equally beautiful part of your home is through the use of traditional rugs. Rugs are stylish decors which can bring an interesting visual component no matter what the area of the house may be. Beautifully made in Afghanistan, this hand knotted rug is a true masterpiece that flourishes with vibrant colors and intricate details. Traditional rugs that have this type of patterns and colors are ideal for neglected spaces because of the bright, lively mood that they create. 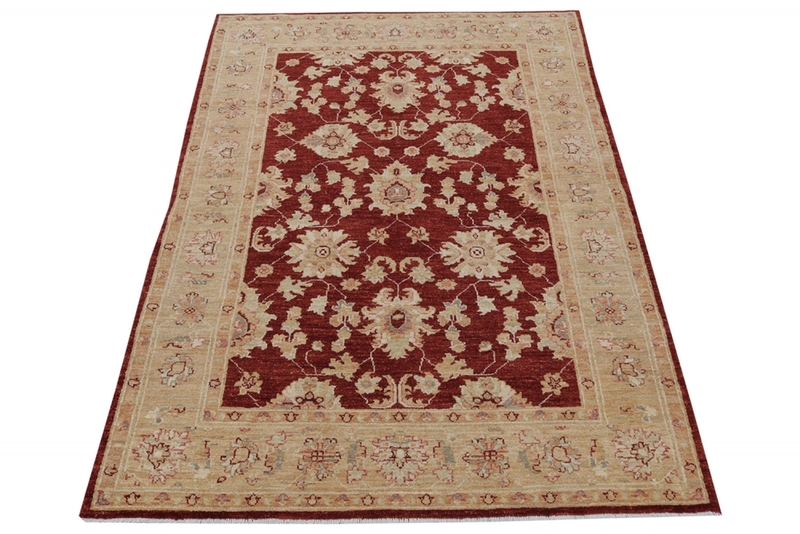 When placed on a foyer, this traditional rug will surely make your house more welcoming. 55 1 Nice blog, I really appreciate it. It is nice to décor area with rugs. A rug can make your house perfect and decorative. I am also choosing rugs from https://therugmall.com/product/amer-contemporary-amanya-ama-1-area-rug-collection/ , they have a nice collection you must check it out. Nice blog, I really appreciate it. It is nice to décor area with rugs. A rug can make your house perfect and decorative.I am also choosing rugs from https://therugmall.com/product/kaleen-natural-fiber-colinas-col01-01-area-rug-collection/ , they have a nice collection you must check it out. 51 1 Nice blog, I really appreciate it. It is nice to décor area with rugs. A rug can make your house perfect and decorative.I am also choosing rugs from https://therugmall.com/product/kaleen-natural-fiber-colinas-col01-01-area-rug-collection/ , they have a nice collection you must check it out. Hey, Great post. Recently I’ve got the interior of my entire house. Reds, strong blues and vibrant greens in particular. Please suggest me the best octagon Area Rug, as I have a wooden Dining table in my dining room with vintage cutlery set and blue color painted walls, Suggest me something which goes absolute fabulous with this combination. . I’ve been purchasing the rugs from https://therugmall.com/product/kaleen-traditional-brooklyn-5310-22-area-rug-collection/they have the great collection of rugs. 44 1 Hey, Great post. Recently I’ve got the interior of my entire house. Reds, strong blues and vibrant greens in particular. Please suggest me the best octagon Area Rug, as I have a wooden Dining table in my dining room with vintage cutlery set and blue color painted walls, Suggest me something which goes absolute fabulous with this combination. . I’ve been purchasing the rugs from https://therugmall.com/product/kaleen-traditional-brooklyn-5310-22-area-rug-collection/they have the great collection of rugs.